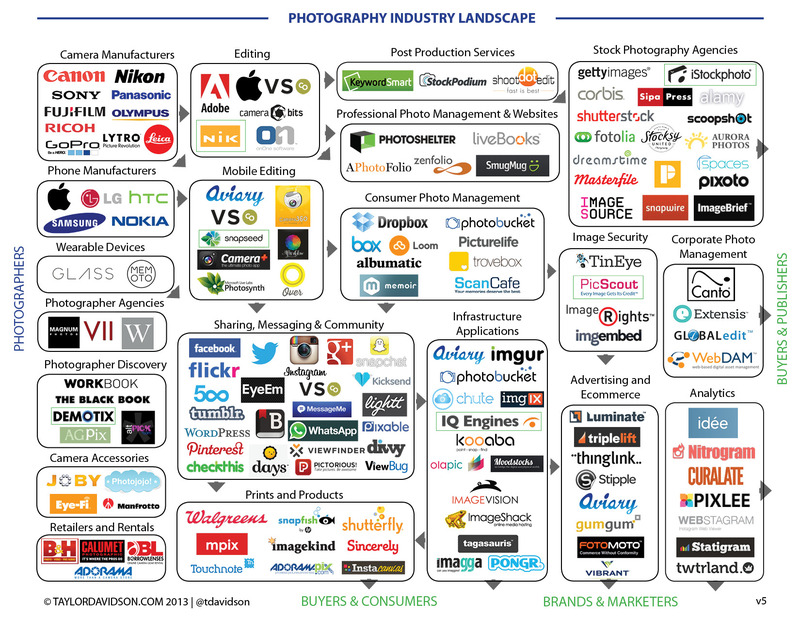 A map of the photography industry for analysis and strategic planning. Update This landscape was originally released and last updated in 2013, a lot has changed since then. This is free to view, download, and print. All I ask for is attribution and a link. The photography industry has gone through a revolution over the past 5-10 years as the introduction of digital cameras, smartphones, social media platforms, and the cloud have created massive opportunities and disruptions in the industry. 380 billion photos were taken in 2012; for context, that’s 4 times as many as just 10 years ago, and it’s 10% of the total amount of photos ever taken. That’s a lot of photos, and it’s created a lot of businesses. The above landscape maps the flow of a photo from the creators (professional and amateur) to a variety of users (people, consumers, brands, marketers, buyers, publishers). The goal of the landscape is to create a common structure for innovators in the photography industry to use for value chain and strategic analysis. The buckets (Camera Manufacturers, Editing Tools, etc.) group companies by their strategic focuses, and are ordered from left to right to map the flow of an image from creation to destination. The goal of a bucket is to give an approximation of companies that provide similar basic functions and solutions. Some companies are mentioned multiple times if their services are broad; not all companies compete directly in a bucket. It’s not meant to be exhaustive in naming all the companies in each bucket, but directional in capturing the main players that exist today. The landscape can be used as a base structure for mapping out the photography value chain, analyzing revenue and profit by bucket, identifying opportunities for new companies, new products, acquisitions, and investment. It’s meant to be directional, not exahustive; and rather than listing the biggest companies in each space, it attempts to identify innovations in each space. Rather than listing five companies that provide similar functionalities, it aims to identify different kinds of companies and innovative ideas. The landscape map above was inspired by LUMA Partners’ LUMAscapes, a collection of maps of the advertising technology industry. They provide a common structure for everyone to understand the value chain in the industry and the various companies involved in the flow of a dollar from an advertiser to a person. It’s a fantastic resource, and I wanted to provide a similar map of the photography industry. If you have suggestions on modifications, interested in collaborating and evolving this, or are interested in leveraging this for analysis, contact me. Thank you to Andrew Fingerman, Tobias Peggs, Shannon Fagan, and Andy Weissman for providing thoughts on drafts of the landscape. Featured in The Next Web, PetaPixel, and more. More: Why do I care about this? Previous analyses of the photography industry, from 2006 to today.